Agri Aware the Irish agri-food educational body have this week launched their healthy eating programme Incredible Edibles with the help of the Minister of State for Health Promotion, Catherine Byrne T.D. 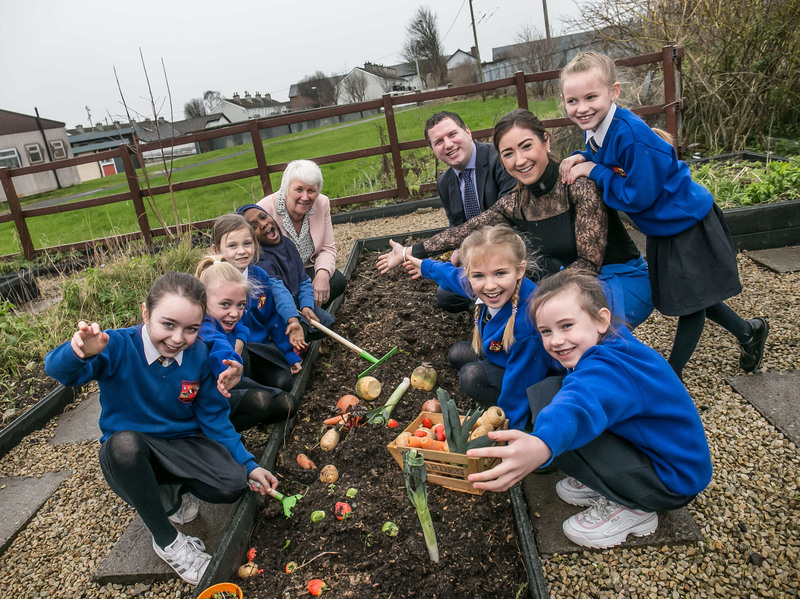 The project now in its 11th year will see over 1,500 primary schools across Ireland learn to grow, sow and cook a whole host of seasonal Irish fruit, vegetables and herbs. The project aims to educate and empower children with knowledge of the full farm to fork journey with schools receiving a free kit containing all the must have tools to start their very own school garden from compost to seed potatoes as well as a host of accompanying curriculum linked educational resources. The importance of empowering students through food education has never been of more paramount with recent figures from Safe Food indicating that 1 in 4 children are obese or overweight. “The ‘Incredible Edibles’ programme brings the important subject of healthy eating into the classroom in a practical and enjoyable way; teaching children about food and nutrition, and showing them how to grow and enjoy their own fruit and vegetables. Under ‘Healthy Ireland’, Government is working on ways to help people and communities to improve their health; giving them the knowledge and skills to make healthier choices. The ‘Incredible Edibles’ programme builds on this objective and is a great way of nurturing a child’s interest in what they eat and what it means to have a healthy, balanced diet. This will help to lay the foundations for them to adopt healthy behaviours and habits which will last a lifetime”. Agri Aware, the independent farming and agri-food educational body, is a charitable trust whose mission is to improve the image and understanding of agriculture, farming and the food industry among the general public. To convey the importance of the agri-food industry among the general public, Agri Aware delivers high impact educational and public awareness initiatives and projects for students and the general public. Incredible Edibles is a healthy eating project for primary schools. The aim of the project is to educate students about growing fruit and vegetables and to increase their knowledge of food origin and quality. It also highlights the important role that fresh, Irish produce plays in a healthy balanced diet and the importance of consuming at least five to seven portions of fruit and vegetables each day. Teachers guide their students through five curriculum-linked interactive tasks to complete throughout the academic year. These tasks are designed to connect students with their new gardens and the healthy food that they are producing. Teachers keep a record of these tasks in a logbook, which are then submitted at the end of the project, in hopes of winning a few prizes. Incredible Edibles is supported by the following sponsors: The Department of Education, The Department of Health (Healthy Ireland), The Department of Agriculture, Food and the Marine, Teagasc, Bord Bia, Keelings, Bord na Móna, Irish Farmers Association, Country Crest and Irish Potato Marketing.